Finland is populated with hardy folk who escape the pressures of daily life (and the cold) with frequent trips to lake cottages in the forest to sauna. Helkatti takes a bit of inspiration from these woodsy traditions and has created a lodge-like environment with trees and rough-hewn wooden tables, but then kicks it up a notch with cozy and sophisticated touches like shearling throws, pops of color and soft jazz music. We arrived on a cold and rainy day and waited outside for a bit before the friendly host let us in, done so to prevent dashes into the busy street out front. Shoes are removed at the door and rules are explained, including the €5 per person entrance fee to help cover the cats care. Speaking of kitties, there are eight in residence, a mixture of white, tuxedo and tabby; all quite young, playful and extremely cute. We were allowed to sit anywhere, but chose the front room near the window where the lighting was better for photos and a couple of sleeping felines enhanced the chill mood. Looking over the menu I was pleasantly surprised to see a wide assortment of sandwiches, soups, salads and desserts. 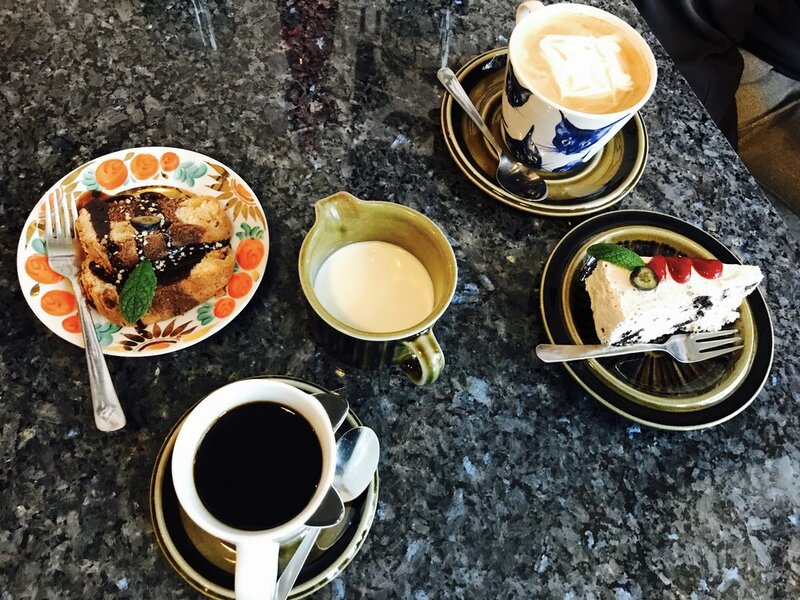 My partner selected a latte and Oreo cheesecake while I picked a filter coffee and traditional Finnish Tiger cake, a marbled bundt served with chocolate sauce and almond crunch. I must give special mention to the coffee. It's probably the best I've had in all my cat cafe visits and among the best I've consumed, period. I come from filter coffee culture (Northern Minnesota) and the Nordic countries are also of this persuasion. It was strong, smooth and flavorful- pure heaven in a cup! The café was moderately busy for a weekday afternoon with a few couples and small groups of ladies dotted throughout the room. The cats seemed to be making the rounds as they moved from table to table, bringing smiles to all of the patrons. While the staff and cats are friendly, the cozy atmosphere and outstanding coffee truly make Helkatti a stand out cat café and must-visit destination when in Helsinki. Can’t make it up north? Helkatti will surely provide a welcome mini-escape.